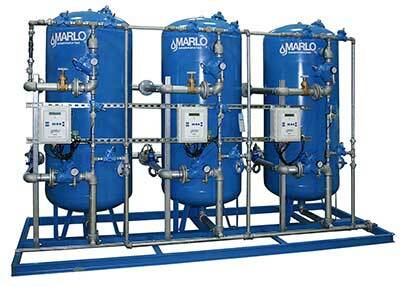 A water softener pertaining to boilers is a product that removes hard minerals from the water, such as heavy metals including calcium and magnesium. Also, the hard minerals can be detrimental to boiler performance as the boiler tubes can be damaged. This can be referred to as scaling. Scaling can prevent adequate heat transfer, reduce boiler efficiency, and lead to premature boiler failure. Here at HV Burton, we can help you! We provide water softeners that circulate the boiler water, which removes hard minerals, before being fed back into the boiler. This prevents scaling and boiler tube damage which in turn allows for a better boiler efficiency and longer use. H.V. Burton offers meter initiated twin-alternating softeners that effectively reduce hard water scale. This results in lower energy costs and longer equipment life. The twin alternating design provides a continuous supply of softened water for critical applications, such as boiler feed, with a fully recharged tank always in standby. Why HV Burton For Water Softener? HV Burton is a leading manufacturer’s representative organization and has been since 1959 when we were founded. We are committed to superior customer service covering all of Michigan and northwest Ohio. Most importantly, we represent several leading manufacturers of boiler room equipment, chemical treatment, heat transfer fluids, water conditioning equipment, steam specialties, vertical flooded heat exchangers, and packaged pumping systems. With decades of experience and still running strong, our goal is to continue to be an excellent resource for our customers. You can be confident that we will bring you personalized solutions and outstanding service. For more information or help with your boiler system, contact us today! We can provide you water softeners to help fix boiler effectiveness and prevent further damage on the boiler tubes due to scaling. Fill out our contact form or schedule a visit from the HV Burton Company. This entry was posted in Water Softener and tagged boiler scaling, how to fix boiler scaling, water softener systems. Bookmark the permalink. Do any of your HVAC systems need glycol?